Creasing – perforating – folding machine. This machine creases and folds all common jobs, including gate fold. The material can be paper, card board and brochures, with high grammage. It can also fold without creasing middle and low grammage papers. The combined layout of these two machines allows to carry out all creasing and folding jobs, plus the basic converting operations. 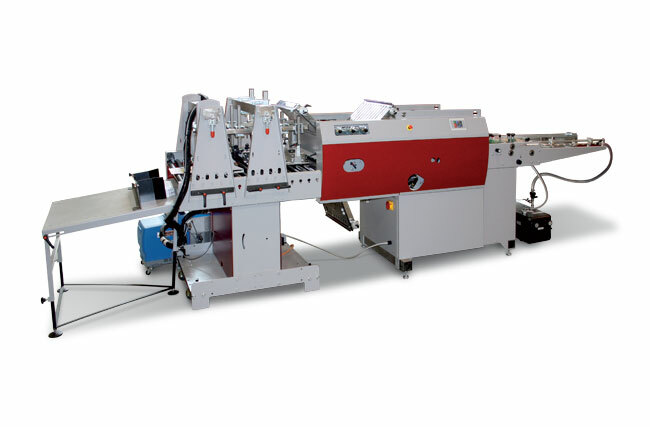 Starting from a die-cut cardboard, these machines can fold and glue folders, shipping envelopes, CD wallets, an so on. Double side adhesive tape can be also applied to theatre bills, envelopes, advertising posters, and so on.